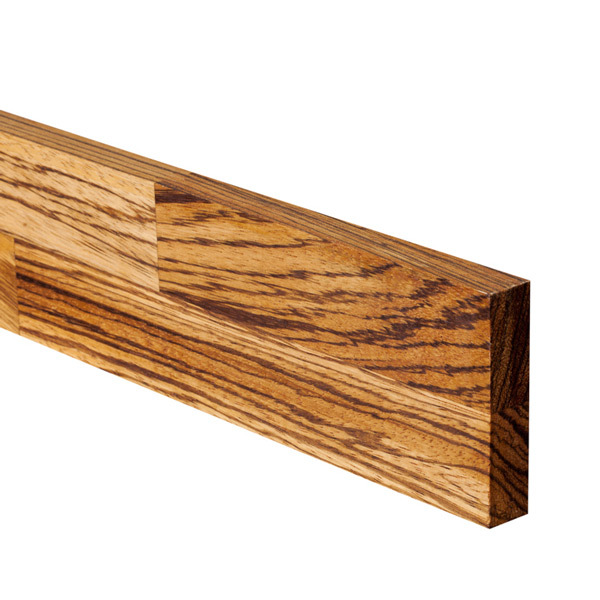 Solid zebrano upstands are manufactured from the same high-quality 90mm staves as our zebrano worktops, and offer an elegant and economic method by which to give wooden worktop installations a 'finished' look (an ideal alternative to tiling). Deluxe Zebrano worktop upstands and matching worktops create a pleasing overall kitchen design, whilst also hiding the required small 5mm expansion gap between the worktop and wall. Expansion gaps are vital in that they allow the worktop expand or contract with changes in environmental temperature. Each Deluxe Zebrano kitchen worktop upstand is supplied with a square edge, and so can be fitted straight away to create an angular, chunky look; or, if you are looking for a different finish, another profile can be applied along the top edge to better suit your kitchen's design.